You may have seen pictures of Hawaii on postcards, with its beautiful beaches, lush gardens and fascinating volcanoes. But the Hawaiian islands are also rich in history and culture. 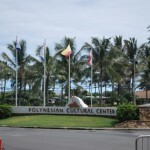 On the north shore of Hawaii’s island of Oahu you’ll find the Polynesian Culture Centre. There, each group of Hawaiian islands is represented in the form of a mini-village from that particular island chain. At the cultural centre, you can visit “Fiji” and play the drums. Then, turn around the corner to “Tonga” to take a lesson in spear throwing, or make a headband out of palm leaves. In “Samoa” learn about how they make tapa (used for cloth and paper) and watch a man climb barefoot, high up a coconut tree. Continue on to “Aeotearora” and see the exciting dancers perform the fearsome Haka. The staff, or people in the “villages,” are actually from the places they represent; most of them are students from nearby Brigham Young University. 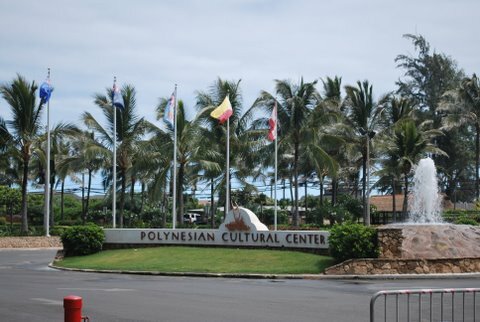 After spending several hours visiting each village, you can stay longer and enjoy a buffet dinner (try the poi) with a show at the Polynesian Culture Centre’s luau. In Hawaiian, luau means any type of gathering of family and friends. Dancers and singers perform traditional dances and songs while you eat your dinner. Afterwards, you can also catch the live theatre performance Ha-breath of Life at the Polynesian Culture Centre. The show traces the journey of Mana, as he trains to become a fire-knife wielding warrior. In the process he must prove his worth to wed the beautiful Lani and protect his family from marauding invaders. Kind of like The Lion King, Polynesian style, but with amazing fire-knife dancers. Tourists who visit Hawaii often choose a relaxing trip that involves a lot of resting on beautiful beaches. However, other tourists choose to spend most of their time learning about the culture and history of the Polynesian people. If you were travelling to Hawaii, what kind of trip would you choose? Why? Today’s article contains many tricky words that can be hard to sound out. A great strategy in these situations is to recognize spelling patterns you know inside the words you don’t. Look at the tricky words in today’s article and circle all the common spelling patterns you can find in each one. Pedict the meaning of and rapidly solve unfamiliar words using different types of cues, including: graphophonic (phonological and graphic) cues (e.g. onset and rime, syllables; similarities between words with common spelling patterns and unknown words; words within words) (OME, Reading: 3.2). A compound noun is a noun (person, place, or thing) that is created by putting two nouns together (e.g. jellyfish) or, in some cases, by putting an adjective (a word that describes a noun) plus a noun together (e.g. barefoot). Make a list of 12 compund nouns: 6 that are pairs of nouns and 6 that are an adjective + noun.